UAMS has partnered with online bookstore Akademos to provide textbook support to students and faculty. When you enter the bookstore site from the button above you will see the page below. UAMS Students and Faculty will log in to the bookstore site with their UAMS username and password. *** Note to incoming first-year students: your login may not be activated in the bookstore yet. If that is the case, you can still enter the site without logging in. 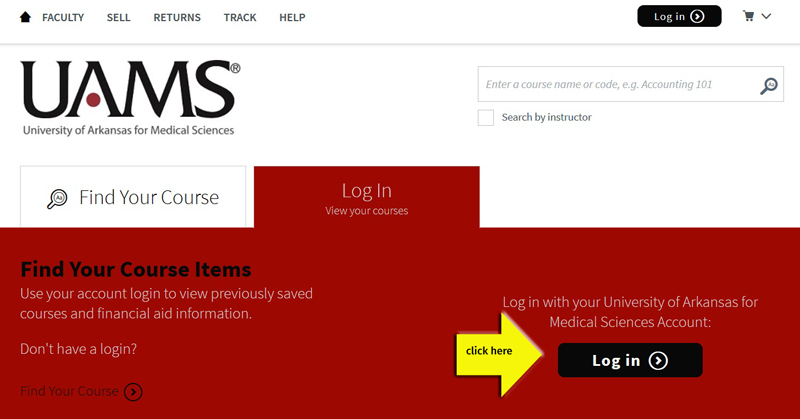 Simply click on the "Find Your Course" tab seen in the illustration above. Then select the semester, your college, then search for your classes by course number. Contact Libby Ingram (leingram@uams.edu or 501-686-6741) for more help.